Voting system: Each country had 10 jury members who distributed three points among their one, two, or three favourite songs. The points were totalled and the first, second, and third placed songs were awarded 5, 3, and 1 votes in order. If only one song got every point within the jury it would get all 9 points. If only two songs were chosen, the songs would get 6 and 3 points in order. 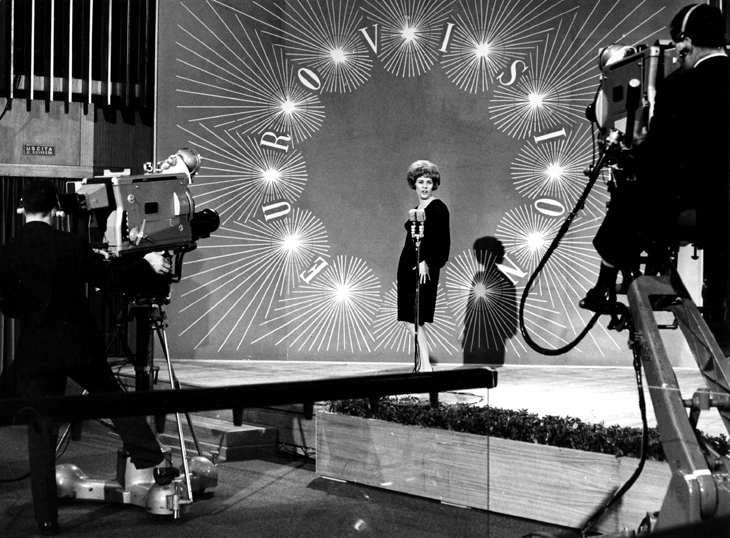 The Eurovision Song Contest 1965 was the 10th in the series. Luxembourg won the contest with the song Poupée de cire, poupée de son, performed by France Gall and written by Serge Gainsbourg. As is common with Gainsbourg's lyrics, the words are filled with double meanings, wordplay, and puns. The title can be translated as Wax doll, Sawdust doll (a floppy doll stuffed with sawdust) or as Doll of wax, Doll of sound (with implications that Gall is a singing doll controlled by Gainsbourg). This was Luxembourg's second win in the contest. The 1965 contest marked the debut of Ireland, a country which later went on to dominate the competition. The venue for the 1965 contest was at the Sala di Concerto della RAI (RAI Production Centre of Naples). The building was founded in the late fifties and early sixties, and is located in Viale Marconi 9, in the district of Fuorigrotta, near the Stadio San Paolo. The structure has three TV studios for a total of 1227 m². and capacity of 370 persons, used for the filming of programs and fiction and an auditorium . The Neapolitan song archives, are also housed here. Italy's hosting of the contest was its first. Participation of 18 countries, also meant the contest reached its highest ever number. After a year of absence, Sweden returned to the competition and Ireland debuted. Belgium, Germany, Finland and Spain all scored nul points while Luxembourg won for the second time with the highly controversial Poupée De Cire, Poupée De Son sung by teenager France Gall which later went on to be a massive hit in almost all European countries. The competition was also broadcast via the Intervision network, to the Eastern European nations for the very first time. Sweden returned after a one-year absence, and Ireland debuted in the competition. Belgium, Finland, Germany, and Spain each scored null points for the second time. Ingvar Wixell, the Swedish participant performed his song in English instead of the original Swedish title Annorstädes Vals. The native languages were used for all of the other participants. This led to a rule being introduced, that meant all participants had to perform their songs using one of their national languages. Three artists returned for a second time in this year's contest. Udo Jürgens from Austria who's previous participation was in 1964; Conchita Bautista from Spain, previously representation in 1961; and Vice Vukov from Yugoslavia, who last participated in 1963.